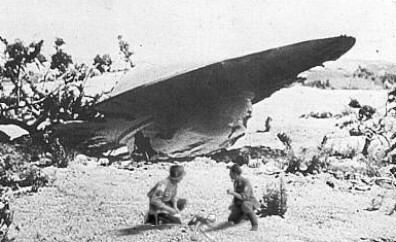 In a recent letter regarding my Feb. 3 commentary on the alleged 1941 UFO crash outside Cape Girardeau, a Tribune reader said: “Wickersham’s public delusions must be terribly embarrassing to the MU community. Thus, it is unbelievable that no one from the MU faculty or administration has stepped forward to defend science and rational thought.” . . .
. . . When it comes to embarrassment production, I am a highly skilled actor. And it is my sincere wish that, as the aforementioned reader suggests, someone from the MU faculty — or any interested citizen — would step forward to have a community dialogue with me concerning science and rational thought as it relates to UFO phenomena. In so doing, I suggest we precede the dialogue with a showing of the film “I Know What I Saw,” a UFO film narrated in part by former Arizona Gov. Fife Symington that has appearances by military generals, pilots, government officials and average citizens. This film would lay the groundwork for a scientific, rational discussion. . . .
Why have we let ourselves be menaced and threatend by nuclear war? Will labor not STRIKE THEM OUT and take the authority to issue our money into the safe hands of labor? Might we not say a prayer of thanks to our precious sweet Father for sending our elders in to spare us from nuclear war? Might we not see these thunder flashes as nuclear weaps being burst off by the protective shield elders have gifted us with?